"This is the end. Hold your breath and count to ten." I sincerely hope that isn't Adele hinting at the end of Daniel Craig in her theme for upcoming Bond film, 'Skyfall'. 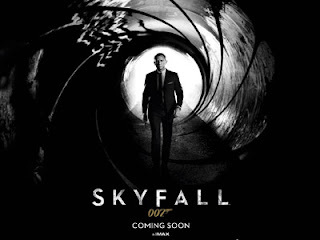 One of the most hyped Bond themes of recent times, 'Skyfall' premiered officially at 0:07. Listen below to the track, written by Adele and acclaimed producer Paul Epworth. 'Skyfall' recalls the Bond themes of old - a smart move, considering other recent efforts. Lyrically, the track is quite bland but that's hardly unusual for a Bond theme. Instead, it's the evocative orchestration and Adele's soaring vocals that appropriately take centre stage. 'Skyfall' might not be a favourite Bond opener of mine but I can imagine it working particularly well over the opening credits of the film, which arrives in the UK on Oct 26th. Find more info at adele.tv.